Candelaria celebrates its biggest day of the year today with tens of thousands of people converging on the Tenerife town to pay homage to its most famous 'resident'. Candelaria - 15.08.2014 - As every year, people walk from all over the island, from places as far apart as Icod and Adeje, to arrive in the early hours of the morning for the celebration of the Feast of the Assumption, which holds special significance for Candelaria given that the town's basilica hosts the statue of a Black Madonna found on a beach by local goatherds in the late 14th century, years before Tenerife was conquered by Spain. 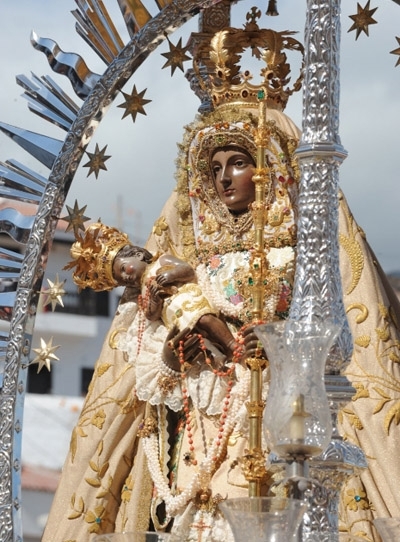 The Virgin of Candelaria is the patroness of the Canaries, where today is a public holiday. The feast day is marked by a solemn procession and a religious ceremony attended by the region's president, although its most famous component is a re-enactment of the discovery of the statue, with locals dressing up as guanche natives.